Harīra (ﺣﺮﻳﺮﺔ)is a traditional soup made in Morocco to observe the breaking of the daily fast during Ramadan, the ninth and holiest month of the Muslim calendar that celebrates the first revelation of the Quran. The soup itself is originally a Berber dish, also known in Algeria. In fact, in tenth-century Tunisia the soup known as samāsāhiyya was a synonym for harīra. There are many variations of this soup, not only because there are many families, and many different families of different economic classes, but also because the Islamic calendar is a lunar calendar and Ramadan falls during different months of the year so the seasonality of ingredients changes. A summer Ramadan soup will be different from a winter Ramadan soup. Moroccans make this particular harīra when Ramadan falls between October and December. The first decision you have to make is if you want a version with meat or not. Both the meatless and the meat version are traditional. The cooking should be slow and long. Harīra exists throughout the Maghrib, but it is this Moroccan version that seems to be the most famous. Traditionally one eats dates and elaborate honey cakes called shabā’k (or shabā’kiyya) or mahalkra with the soup. Some cooks add pasta or rice, chicken liver or gizzards, dried fava beans, or yeast (in which case the flour mixture in Step 4 is not used) in addition to the elements below. Or rare spices such boldo (Peumus boldus syn. Boldea fragrans, Peumus fragrans) called balduh al-faghiya in Arabic, the berry of a slow-growing evergreen in Morocco that is used in place of caraway. The tomato mixture in Step 2 and the flour and water mixture used in Step 4 is known as the tadawīra in Morocco. Great souvenirs to bring back from Morocco are the little earthenware soup bowls used to eat harīra. Soups in Morocco tend to be supper dishes, heavy and filling, and not as a first course. In Morocco, when one encounters a soup served as a first course that is most likely a French influence. 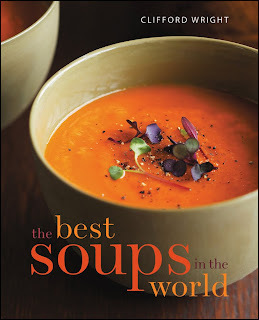 You can read more about Ḥarīra and find the recipe in my new book THE BEST SOUPS IN THE WORLD to be published in December by Wiley.